Ginisang Delatang Salmon. Being an OFW myself ginisang sardinas is a regular fare for us. Sardinas is nutritious, cheap and easy to prepare. Most overseas Pinoy would likely not miss picking a week’s supply of canned fish on their weekly visit to their Asian Store. If you are located on an area where there are no Asian Store it is always worth a try to check out the Asian section of your favorite supermarket. That is of course if are really craving for Pinoy canned fish. Otherwise check out the canned food section for good canned fish. 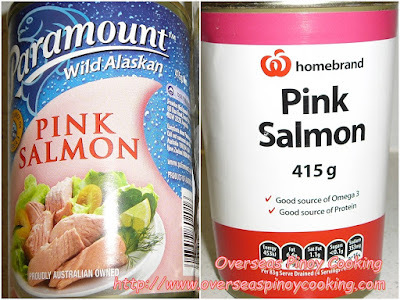 On my last visit to Woolworths Supermarket I picked up a couple of Australian canned salmon in brine. I have been very busy with work lately. I intend to cook these canned salmon Pinoy style, Ginisang Delatang Salmon. Cooking is quick and easy, it only require basic ingredients. Canned fish are literally already cooked and ready to eat. All we do is to lightly cook the canned fish to incorporate some ingredient to improve the flavors. Otherwise caned fish or sardinas can be eaten straight from the can. Should you have arrived on this post looking for ways on how to cook canned fish just click the lick list of my previous canned fish post below to check the recipes. Here is the recipe of my Ginisang Delatang Salmon. In a wok or frying pan heat some cooking oil. Add in the garlic and stir fry for about 1 minute or until the color changes to golden brown. Add in the onion and the tomato, stir cook for another 1 minute or until the onion and tomato starts to wilt. Add in the canned salmon meat, lightly break making sure that the fish does not disintegrate. Stir cook for about 1 minute. Add in the brine, about 1/2 cup of water, the chili and parsley. Let boil and simmer for 2 to 3 minutes. Season with salt to taste. Serve hot with a lot of rice.